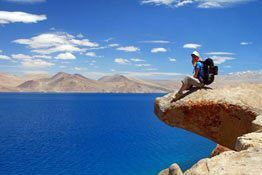 Located in the Changthang area in the state of Jammu & Kashmir, Tso Moriri or Moriri Lake is the largest high altitude lake in the Trans-Himalayan region. The lake water is fed by springs and snow melt from the mountains in the Changthang plateau. The two major sources of water entering into the lake are located in north and southwest respectively. Until 1959, the lake was the source of salt for the local populace. Located on the west bank of the lake, the 400 year old Korzok monastery attracts a sizeable chunk of tourists and Buddhist pilgrims. 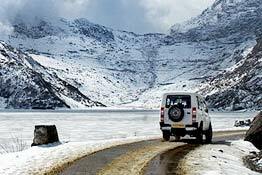 Encompassed by snow-capped mountain ranges from all the sides, Tso Moriri is situated slightly off the Manali-Leh road. A sandy road passing through the Rushpu Valley leads to Tso Moriri. One can also access Tso Moriri directly from the Pangong Tso via the Changtang plateau. The distance between the two is 235 kilometers and there is no petrol pump in the mid way. The best time to visit Tso Moriri is between May to September as it gets frozen in winters. Located in the ancient village, on the western bank of the Tso Moriri Lake, Korzok Monastery is a Tibetan monastery that belongs to the Drupka Lineage. 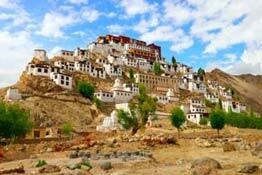 The monastery is around 400 years old and attracts a large number of Buddhist pilgrims and tourists. The lake is an important breeding point for avifauna species and as many as 34 species of birds including 14 species of water birds such as Black-necked Cranes endangered, Black-necked Grebe Podiceps nigricollis, Brown-headed Gulls, Great Crested Grebeand Bar-headed Geese. The region has ample amount of wildlife which include the famous Ladakhi Bharal, also known as Blue Sheep, and the Himalayan mountain goat. Other rare animals which can be spotted here include snow leopard, lynx and grey wolves. The two days long Korzok Gustor festival, which takes place in the 6th month of the Tibetan lunar calendar, attracts many Changpa nomads and tourists. The ceremony symbolizes the victory of good over evil and pays homage to the assassination of a traitor Tibetan king by a Buddhist monk. The festival ends with the dispersal of the 'Storma' by the Black Hat dancers leader at a ceremony known as 'Argham'. For local and foreign tourists, the facility of the tented accommodation and a small PWD guest house is available nearby Tso Moriri Lake. Tso Moriri Lake is located at a distance of 240 kilometers to the southeastern part of Leh. One can travel to Tsomoriri straightaway from the Pangong Lake through the remote Changtang region. It is advised to carry enough fuel for the journey as there is no petrol pump en-route.